Roland & I wish to thank all the customers who stopped in to shop on Record Store Day. It was quite the event. We had 100’s of exclusive releases to offer plus free gifts for everyone and a snack table. Also had several items for free draws. See list below. Our oldest grandson Dylan (ballot draw & giveaways counter) both of whom made the trip from London to help us out. Lastly, thank you to all the record labels/distributors of the amazing fill we got on our orders. RSD would not happen without them supplying the exclusives. 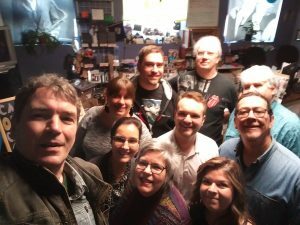 Thanks also to Ryan Kerr of RSD Canada for the hard work he and his team put in to organize Record Store Day Canada as far as the exclusives and more. 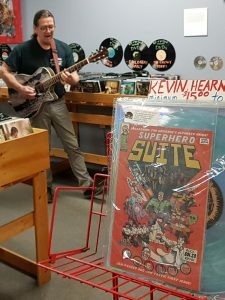 For those who donated to MuisCounts by picking up a limited edition Kevin Hearn -The Superhero Suite EP, you will be happy to know, thanks to you, we were able to submit $400 in total. Thank you for your kind donations. The big difference this time around was that the lineup seemed to be moving faster. It wasn’t quite as long either but it kept replenishing itself, which was a good sign. There was music playing as well. It was obviously being performed live but there was no musician to be seen. Minstrel, O Minstrel, where for art thou? The most likely answers were that he was lost among the crowd or hidden by the displays. That was all fine though. Record Store Day is one of those times where the displays are bold and the store should be swamped. The musician, Mike Blackmore, was mostly hidden by one of the displays. The sounds coming from his little corner were clear enough and unmistakable, which again, is how things should be. Mike isn’t just “any musician”. His voice has a unique timbre that combines the rough edges of sandpaper with incredible sensitivity. His work on the guitar is the same way. It’s emphatic, with a chop permeating the rhythm parts that’s countered by a gentle touch in the lead passages. His delivery grabs listeners without being abrupt or harsh. With the amount Mike performs in this area the singular approach he brings to songs should be familiar. His material, a blend of covers and originals, is generally familiar but his approach is one that could have run through the mind of a jazz player before landing in the hands of someone who leans toward folk or bluegrass. It’s never exactly the same twice and (depending on Mike) takes on any number of forms. Getting an “Irish” take on ‘Hotel California’ can’t be explained in any other way. It worked really well though. All that was missing was glasses of dark ale being raised in a toast. His sound rang clearly throughout the store. A tower attached to his bass speaker boosted the treble and midrange to amplify pitch without raising volume to levels that would interfere with the affairs of the store. It also provided excellent separation between the drum and guitar tracks he created using the looping device and gave things the sound of a full band. Having a wireless connection on his guitar allowed him to move freely. That Mike’s use of these devices is always tasteful is a point that always stands out. He never uses the effects in ways that are excessive. The main reason the lines moved faster was that one till was used specifically for cash transactions. Using cards may be more convenient but it isn’t necessarily faster. It’s something I’ve noticed before and it was obvious on this occasion. People seemed to be blowing through that line at speeds that have been unheard of since crowds began having to cope with the nuances of individual debit machines. It might also have provided incentives to come back a second time or to linger after a purchase had been made. Many people who came to event were in the shop browsing for a long time even after the crowds had thinned out. The displays were eye-catching. One thing that’s clearly been lost in the transition to digital is the artwork that graced album covers. Not all of it was great and the worst designs belonged in cheese factories. It was all arresting though. Nobody who saw the artwork Richard Corben did for Meatloaf’s ‘Bat Out Of Hell’ when it was a new release is ever going to forget it. The same can be said of the Beatles’ ’Sergeant Pepper’, ‘Revolver’ and ‘Rubber Soul’, ‘Eldorado’ by the Electric Light Orchestra, ‘Brain Salad Surgery’ by Emerson, Lake and Palmer and a host of others. One of the display’s at this particular Record Store Day celebration had an album with a striking photo of the young Madonna on it. When it was in view her eyes followed you around. Another jacket featured a heavily shadowed image of Emmylou Harris emboldened by a dark silver-grey framing. It’s a form of magic, one that became part of the music by way of association, and it’s not something that comes about when the product is wrapped in jewell cases. Add the fact that analogue sound is richer and the sum is that something’s been lost in the name of convenience. 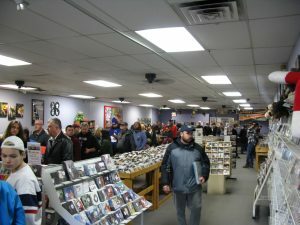 Record Store Day Celebrations and the success they have suggest that it may be on its way back.